Shreya Tatkar is a junior double-majoring in International Relations and Economics with a minor in French. Her academic interests include international economic relations, more specifically on the African continent and between French-speaking states. 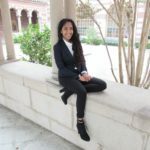 On campus, she is currently involved with the USC Journal of Law and Society as an Associate Editor and Delta Phi Epsilon (USC’s Foreign Service Society). Her professional experience includes internships with the ACLU of Southern California’s Jails Project and with Warner Bros. Entertainment’s Sales Planning and Distribution teams. She looks forward to writing with the Glimpse community this year.